To start cooking, use several sticks of kindling to build a fire on the firebrick lip of the oven, where the bricks jut out in front. Once the fire is going, use a long wood-handled instrument to shove the fire inside the oven -- we use a grass whip . It doesn't matter exactly what you use, but it needs to be long enough to stick into the back of the oven while keeping your hands well outside the oven, and it can't have a metal handle because it would get too hot to hold -- you'll be using it to shove glowing embers around. You'll need to keep tending the fire constantly for about 30 minutes, feeding it more kindling and shoving the embers around to all parts of the oven (firebrick) floor. We recommend drinking beer and yakking with a friend while doing so. inside the oven in order to get the hang of gauging the temp of the oven. The numbers burned off the thermometer after a few fires, but now we know that after about 30 minutes, it's about 750 degrees, and it's ready for pizza! Use the grass whip to push all the glowing embers/wood to the outer edges of the oven, forming a ring of fire and distributing the embers as evenly as is reasonable. Use a short, damp-but-not-wet rag mop* to swipe the firebrick surface at center of the ring; that's where your pizza is going to go, and a quick swipe with the rag mop will keep the bottom of the crust from getting too ashy. Meanwhile, at the pizza-construction operation, put about 3 tablespoons of dry corn meal on top of the peel and spread it evenly over the surface of the peel. Then -- and only then! -- put the pizza crust on top of the peel. Add toppings according to your favorite recipe, and take the pizza out to the oven, where your firetender has been faithfully feeding the fire. Hand the uncooked pizza on its peel to the firetender. Standing with the peel between the lip and the center of the oven, the firetender gently shakes the peel so the pizza can be rustled on to the firebrick as close to the center of the oven as possible. With the temp at 750 degrees, the pizza only takes about 2 minutes to cook, so be ready to pull that thing out of there and get it to where the hungry people are. The first pizza is transferred from the movable surface to a pizza peel, and delivered to the firetender, who puts it in the oven for about 2 minutes. Meanwhile, the second pizza is transferred to another peel, and delivered to the firetender at the oven. The firetender removes the first pizza from the oven using the first peel, and a delivery person runs pizza and peel inside to the hungry crowd. Meanwhile, the firetender uses the second peel to get the second pizza going. The firetender and the delivery person will alternate peels each time. How long did it take you to make the oven, from start to finish? Did you take a break, I mean could you stop during any part of the process? I can see that building the base would be a labor of love, to find the stones. However, once you started with the clay, did you need time to allow it to dry? I have enjoyed reading your posts. Thank you for the information. Thank you for taking the time to post this. It is very clear and well written. Is the purpose of the 5 foot pit to allow for drainage? Or is that the frost line in vermont? It seems remarkably deep. Oh but wait! When did the straw go in? I asked myself the same question, but it must go into the adobe mixture as the fibrous material since according to Wiki: "Adobe (/əˈdoʊbi/, UK /əˈdoʊb/; Arabic: الطوب) is a natural building material made from sand, clay, water, and some kind of fibrous or organic material (sticks, straw, and/or manure), which the builders shape into bricks (using frames) and dry in the sun." The straw goes into the outermost layer for structural strength. It’s great to bake pizza whenever you want in your own brick oven in your home. For as long as you have the ingredients with you, there’s no problem! ;) You can have a pizza party with your family or friends. That’s absolutely fun! Being in Vermont, he dug to below his frost line. My oven in texas sits in a 6" deep hole, mostly for stability. I would love to make one of these. When do you make the hole larger in the front of the oven and when do you add the straw and why was the hole so deep? can this be used in the winter without fear of cracking? BTW I am going to build an outside oven this year, probably using your directions. Thanks for sharing! Thank you for sharing your post. I'm from Northland, New Zealand & am interested in making a pizza oven. This is well worth considering. Wow - a fabulous idea and excellent, crystal clear directions. I'd love to do this - we also live on top of a huge rocky area - ex gold reef with filled in mines literally on our doorstep. Stones will be easily found on site - have to buy clay though - is artists clay OK to use??? Many thanks, Kate in Bendigo, Australia!! Wow! Lots of work and research let to a great pizza-bread oven. Thanks for sharing all the steps. Anneke, Europe, The Netherlands. Have you tried cooking anything else in your oven and if so what??? I would love to be able to cook many things in it I guess you could by letting it cool to the right temperature of what your making. Hey Linda, I'm in Texas too and you'd be surprised how many places we have that do cob and adobe. There are workshops in Granberry and Houston. I'm not sure about Austin but I know there a cob homes there. You can make anything in a cob oven that you would in a regular wood burning oven. You can make a whole thanksgiving dinner in one. I have a cob oven in Austin and it is great for roasting as all the moisture stays in the oven. I've done many chickens and a turkey inside. Also, roasted lamb benefits from the wood fire cooking. With the fire swept out, I've baked pies, cookies, bread and pots of beans as the temperature declines. this is awesome. how well does it hold up in rain? how long have you had it, and do you need to do any repairs throughout the years? Please do you have any (exploded drawings) of this wonderful oven? Is it a pedestal with an oven on top? How and where does the fire sit and exhaust and breath? Is the fire in the Pedestal and breath somehow through the rocks and somehow exhaust out the door of the oven? Can you put a cover on the oven for baking or is it best left open? In large font for old eyes, Please educate us. Dave & Robin, thank you very much for sharing the detailed plans on building the Cob oven. Instructions were clear and easy to understand. All, there are a couple of questions as to what the five foot hole was for. My understanding is the hole was dug just to extract the clay. It serves no purpose beyond that and is why they filled it with gravel. I am under the impression that you don't even need to dig the hole if you are able to get clay from another source. Simply to avoid the eye sore of a pit of gravel, they built the cob oven right on top of the hole. I hope my observations help to clear the air. If I am wrong, please correct me. Thank you. The gravel was for drainage. All cob structures need at least a foot or two of drainage under the foundation and a foundation of stone or brick built up at least a foot above ground to protect the integrity of the cob. They simply filled in the clay pit gravel instead of digging a new foundation site. Cob also needs a roof or protective coating like tadelakt to help protect it from the elements. The reason their oven cracked is because they forgot to put an insulation layer on the dome. You do this by putting a layer of cob on the newspaper then make about an inch thick layer of wood ash then another layer of cob to seal it in. Thank you so much for sharing your adventure in making a cob oven. You've done a great job in detailing the process, and adding some humor into it - though I, personally, think the ibuprofin should be listed with the oven materials - as it will be needed by us gramas& granpas when stomping the adobe and smashing fingers with the rocks. I have done much research myself, into the worlds of cob/adobe building, solar, hydro, tiny homes, and more - and your blog leaves me wishing that more I'd read had been done like yours! While I can not build the oven at this time, in the city where the landlord says 'no' to permanent structures ... your info will help me convince a friend or two to allow me to build a 'practice' oven or two at their homes! Thanks for this very informative guide. So do you keep the wood-fuel burning inside the oven while you are cooking pizzas? Wow thanks! 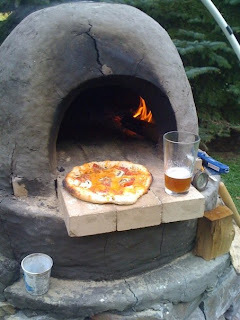 I was considering using block and brick, but now I can save some $$ and still have a great pizza oven. Thanks for all of the information! it was entertaining as well. I'll give it a go in the early summer after the rush of trout season. have you tried cooking fish in a salt crust in it? Overall nicely done! I smiled through the entire post; great practical project and a wonderful perspective! I'm looking to build a pizza oven to complement the smokers and grills that we currently have. Thanks! How cool is this! Though I will probably never be able to build one of these, this added another item to my bucket list. Very well written and illustrated! Thanks for the new dream thing. Thank you for your very entertaining post. I have really enjoyed reading it. I am also building an Adobe/cob pizza oven and have followed a very similar process to you. I noticed that one of your other readers wanted to know what the straw was for. If you want to use your oven for more than pizza, you can add two more layers. The first one is made from a mix of mud and saw dust. This forms an insulation layer. The other layer is made from straw and mud. This is a sculptural layer that also holds the insulation together. Your oven will now retain heat for long enough to make beef, cook roasts and even a casserole. Thanks for the great post - very entertaining and helpful for someone considering building an oven. I have one technical question; you mention that you decided upon a 45" diameter oven, however the pictures seem to show that the fire brick pattern is 5 bricks wide. 5 x 4.5" per brick would be only 22.5". Can you clarify? Fantastic! Thanks for the info. I'm going to have a go at this in the summer. Ive got a corner of my patio where this would look great. I.m going to cheat a bit though, I'm going to use a cement mixer! 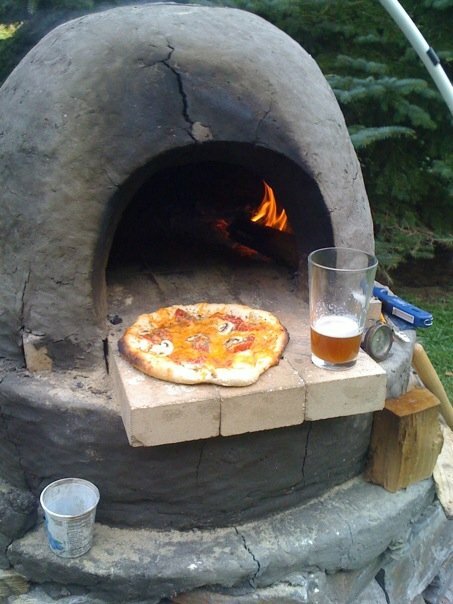 it does not look that simple to build, but it is awesome, I would love to have one in my backyard, since I'm italian and i do make home made Pizza. Well done! i have read your tutorial on the cob oven, i have a question, what was the bale of straw used for? it isn't in the tutorial at all. Me and some friends have built one of these two years now at a 2 week camping event we all go to each year. We have to destroy it each year and build again. Site rules...no permanent structures. It's hard work, but to be able to bake while camping is worth every minute. We've even sourced our mud from the stream on site. We do have to add commercial clay to make it work better. Bread, cakes, brownies, pizza...YUM!! Sounds suspiciously like an SCA event...? I love what I read, and I miss Vermont (grew up in Woodstock). why do you need a deep pit? Could you build a base with a shallow (6") layer of concrete or cement, and then build the rock ring on that? Usually I make hangout with my friends into my house and outdoor and all of my friend loves to enjoy the wood fired pizza with me. I think I need a wood fired pizza oven to make pizza home or out door. Very entertaining and at the same time educative post. One of the most entertaining and informative things I have ever had the pleasure of reading! Can't wait to try your version which is particularly attractive! It's just wonderful share,.. I really like it,. We have a cob oven and we build the fire right inside the dome, not on the lip. At first my husband thought he had to build it at the opening, but the person who helped us build it told us that the dimensions of the inside of the oven makes for a perfect convection, so you can build and maintain the fire inside. maybe that's why the lip of your oven is cracked-- because you build the fire at the lip? We're copying your project! We are gathering materials and I'm working on the hole. Question: you say the hole is 3' in diameter, but your stove floor up at waist level is 48" in diameter. I'm guessing you're just being a little loose with numbers? Doesn't the hole/foundation have to be as wide as the oven floor? Awesome job!!! Absolutely loved reading this. I will soon be attempting to buid my own adobe oven. Question? I have a fairly rooty yard, couple of oaks, is it necessary to dig a footer for your tower? The footer is there to keep it from heaving with winter freezes. You need only dig down to your frost line. Some build a sort of stout table-top as a foundation for their ovens instead of a stack of rocks or poured concrete. Bear in mind that these ovens are heavy. As a rule of thumb, each bucket of dirt or sand will weigh about 50-60 pounds.
. Is it harder to build an oven based on a door than say building an oven first and then looking for a door? Thanks for taking the time to read my questions! Have a great day! This type of glass material work using boom lift, its ok for customer side react more satisfaction and their refered boom lift rental machine most of company and buying refered to Sendhamarai Engineering. I am so amused by this blog. You two must be a real hoot to watch build something. We are going to give this a go. I must ask a few questions. Why do you have to dig 5 feet deep and then fill with gravel? Did you keep the rock face rough? Does the base have to be round or can the bottom be squared off and then the rounded dome built on top. What caused the crack above the opening, will that be a problem? Did you build a door to slide into the opening to keep critters out? Great Post!Thanks for Sharing this! Our community garden want to build a cob oven. How much does it cost for someone to come to Utah and teach? i really enjoyed your post in Made in India thankyou. Nice Blog. Thanks for Sharing. Let us have a look into our Drying Ovens and Curing Ovens. It's really an informative and well described post. I appreciate your topic for blogging. Dominos Pizza Franchise New Zealand - Find out how you can own your own Dominos Pizza Store. The blog was absolutely fantastic! Here Lots of great information regarding outdoor kitchen, if you want to read more about Outdoor Kitchen you can check out. The best use of reclaimed brick is in the interior of Café and restaurant to give the vintage Look. For the wooden exterior, cedar cladding is the unique solution for the exterior design of your building.